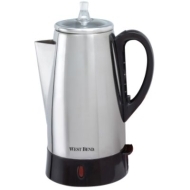 alaTest has collected and analyzed 13 reviews of West Bend 12-cup Coffee Percolator. The average rating for this product is 4.6/5, compared to an average rating of 4.4/5 for other products in the same category for all reviews. Reviewers really like the noise and design. The durability and maintenance are also appreciated, but there are some critical views about the reliability and price. We analyzed user and expert ratings, product age and more factors. Compared to other products in the same category the West Bend 12-cup Coffee Percolator is awarded an overall alaScore™ of 82/100 = Very good quality. Should have sent it back, but instead placed a "candle plate" under it to catch the mess it makes every time it is used-thought it would be a good one because it looks good and it was one of the more expensive ones. This percolator is the best, gives the coffee a great and delicious taste. Keeps the kitchen smelling good all morning. The reviewer indicated they received a sample of this product. Bought for a friend for Christmas, then had to have one myself! West Bend Percolator = good HOT coffee! This coffee maker is ideal for an office. Good quality. It made of aluminum. It brews coffee quickly. Flavorful tasting coffee. Our church uses this model, and it has stood up under heavy use for quite a long time now. Best of all, it is very reasonably priced. It is straight forward in ease of use, and keeps the coffe very hot!